Theresa May called the 2017 General Election with one goal: to get herself a huge majority and prove to the country that democratic socialism was dead once and for all. She was, unfortunately, proved entirely wrong. It is astonishing that the Conservatives were saved by Scotland, despite receiving over 2 million more votes than in 2015. So, why did this unexpected result actually happen? The first reason is the diabolical campaign put forward by the Conservatives. As a member of the party myself, I was highly critical of our campaign. “Strong and Stable” was the Conservative, or rather Team Theresa’s mantra, with the campaign focused almost entirely on the Prime Minister. However, her refusal to turn up to the TV debates, as well as the U-turn on the deeply controversial social care policy, made her look only weak and wobbly. The social care policy ended up alienating the core Tory vote. It would have been far better for the Conservatives had she turned up and performed badly, because at least she was prepared to defend her record, rather than sending out Amber Rudd in one particular debate despite her father sadly passing away less than 48 hours before. Additionally, there was no focus by the Tories on their economic record. Gone were the days of the “long term economic plan”, ensuring our economy was balanced correctly through the creation of the Northern Powerhouse. There was no mention of the fact that the deficit is down by over two thirds from 2010, nor that there are 3 million more people in work now than from the same time last year. It is staggering that a party with such an impressive record on job creation over the last seven years decided not to plaster it all over their billboards. Instead, all we got was the same old message that May was better than Corbyn, and therefore people should vote for her, and that Corbyn would tank the economy through reckless borrowing. With hindsight, this was a huge mistake. After over a decade of Labour pumping in buckets of cash into public services, following seven years of austerity people are starting to want that money back into public services. ‘Project Fear’ part three - having campaigned against it last year in the EU referendum, also disappointed me. The only Tory message was that Jeremy Corbyn called Hamas “friends” and worked with the IRA, and that a “coalition of chaos” would be propped up by the Liberal Democrats who would stop Brexit and the SNP who would break up the country. There was nothing else. In fact, it stared directly in the face of one of Margaret Thatcher’s most famous quotes: “if they attack one personally, it means they have not one single political argument left”. This is entirely true. We had nothing better to offer than Jeremy Corbyn in terms of policies, so we attacked him. This made him look like the innocent old man who wants to give presents to everybody. Whereas Labour attacked us over the NHS and school funding, we attacked them over what their leader said over 30 years ago. The Labour campaign, on the other hand, was filled with an apparent hope. A hope that young people, such as myself, would not have huge university debts; a hope which the vast majority of young people fell for. A hope that the NHS would be “saved” after seven years of “Tory cuts”. A hope that there would be enough teachers to educate children. Corbyn offered something the UK hadn’t seen in full force since 1983 – a left wing socialist party that wanted to take from the rich and give to the poor. He got out the youth vote incredibly well – over 1 million 18-25s registered to vote after the election was called, and turnout was up on 2015 by over 2%; something that the Tories failed to capitalise on. Corbyn picked up much of UKIP’s vote. In 2015, UKIP was the major recipient of the protest vote – people who didn’t want business as usual. This time around, Labour were similar to UKIP in 2015 in that they were the party that wanted to be different. What was most striking to me was that, after the year 2016, the Conservatives failed to pick up on an anti-establishment sentiment. We saw it with Brexit, and we saw it with the election of Donald Trump. People are not the same as they were in 2015, when they saw the need to carry on mending the economy. In 2017, they wanted change, and that played into Corbyn’s hands. The Tories, in the end, were saved by Ruth Davidson in Scotland where they won 12 seats. They recognised the need for a unionist voice in Scotland, while picking up some Yes voters who wanted to leave the EU. People in Scotland were beginning to see through Nicola Sturgeon’s thinly-veiled commitment to independence and her party’s terrible record in education. At least Alex Salmond got what he wanted; independence from Westminster. It should also be noted that both Labour and the Lib Dems made gains in Scotland too, at the expense of the SNP, potentially showing that the dream of independence may be over sooner than Sturgeon and Salmond thought it might. However, the Tories should not see 12 seats as a ceiling. They should be working to draw more seats from the SNP at the next general election, whenever that may be, as the biggest unionist voice in Scotland. Now to the second question: where do the Conservatives go from here? Last year, before the referendum, I wrote an article for Student Voices suggesting that the Tories had messed everything up and should have been, “well, conservative” with their poll lead. In my conclusion to that article, I wrote these exact words: “As far as I can see, there is only one outcome possible in 2020. A hung parliament, even at this stage, seems likely.” Alas, I was right, albeit the election came sooner than I had anticipated. Now, that poll lead, which was significant even before the Brexit vote, has evaporated. There can be no playing safe anymore. There must be a shift back towards the right – not so far that we alienate swing voters as happened in the early 2000s, but one that brings together the core Tory vote as well as undecided voters. Centrist politics is in decline, so why the Conservatives reverted to it this year I will never know. There also needs to be a change towards much more positive campaigning. We campaigned this year on the premise that Corbyn was bad, but we had nothing to counter his proposals, which clearly didn’t have the intended impact. 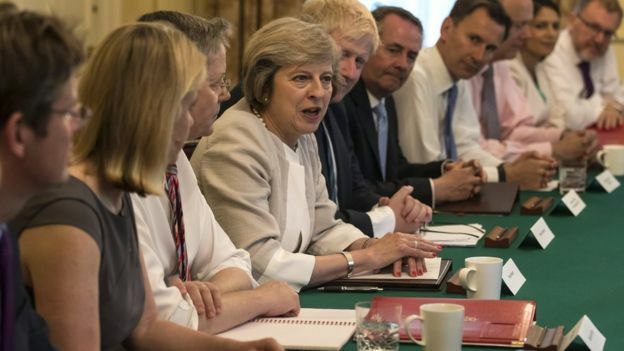 Finally, CCHQ and Number 10 need a major restructuring – no more advisors, like Nick Timothy and Fiona Hill, gaining too much power like Thomas Cromwell in the 1530s, and no more silly policies like a vote on fox hunting. If this doesn’t happen, we may well be looking at Prime Minister Corbyn after the country next heads to the polls. To summarise, then: the Tories need a major rethink in policy and election strategy. In terms of the result, well: the Conservatives won but lost. Labour lost but won. The SNP won and lost in Scotland. UKIP lost but because of Brexit they’ve already won. The winner, Theresa May, is being told to resign because she lost. But she won’t. Because she won.